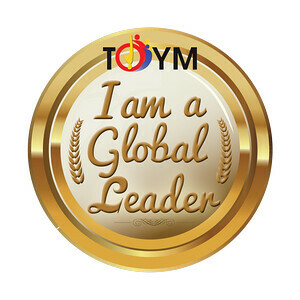 Have you ever wanted to purchase something online but couldn’t because it would be too much to pay one-time within a month or so? How I wish I could buy airline tickets online automatically on installment as I’ve already had quite a number of online airline ticket purchases that would have been made even better if payments were spread out. For a minimum spend of P3,000 at BDO partner merchants, all BDO Credit Cardholders (except Corporate, Commercial, Tie-up & CUP credit cards) have the option to pay on 3, 6, 12, 18 and 24 months installment terms for online purchases until December 31, 2012. Cardholders may choose to avail of either the Absolutely Zero Percent or Regular Installment promo offer. It’s such a great deal, right?! 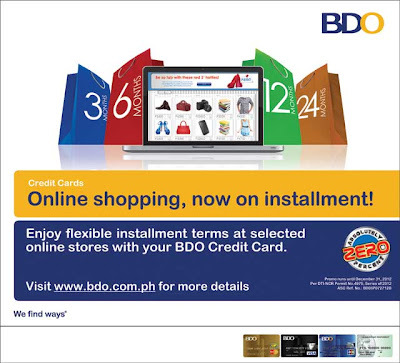 So with your BDO Credit Card, you can now purchase products and services from Ensogo, Filgifts.com, Reebonz, Hallo Hallo Mall, Deal Dozen and the Philippine Hotel Reservations Service on installment. Other BDO online partner merchants include ZestAir, Ava, CashCashPinoy, City Delivery, Zalora, Shopinas.com, Gupo and Lazada. If you have a BDO Credit Card, you should not let this opportunity go to waste especially with Christmas just around the corner. This would be a great - not to mention convenient - way to complete your Christmas list and be able to spread out the payments to make it easier on your pockets! For more information, visit the BDO website.